A colour photograph of Cullen Cottage. The Cullen Cottage was built circa 1850 in North Gower, Ontario, 20 minutes southeast of Ottawa. Leonard Cullen found the cottage during a trip through the area. He paid $100 for the cabin and had it disassembled. 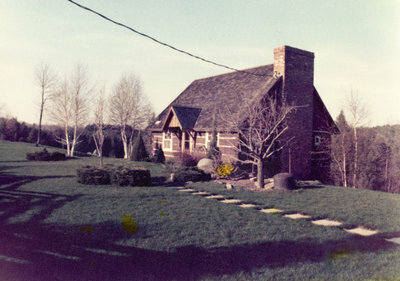 In the summer of 1968 the cottage was rebuilt on the future site of Cullen Gardens and used by the Cullens as a summer home. Cullen Cottage, Date Unknown, Photographer Unknown. Whitby Archives A2013_042_008.